You don't need to shell out big bucks for Adobe Photoshop to make your family photos presentable. Microsoft's Windows Live Photo Gallery tool is free and fun to use, and it has more image-adjustment options than you might expect. Here's how to use some of its especially handy features. The core adjustments in Windows Live Photo Gallery are grouped together under the Edit tab of the ribbon interface at the top of the screen. The first of these options is Auto Adjust, which supports one-click fixes for many common problems that you might have with a given image. Generally it does a pretty good job; and even if you don’t like the results, they are provide a reasonable starting point for further tweaks. For a bit more control, click the drop-down arrow, and choose Settings. You'll be taken to a menu that lets you choose the specific adjustments (Straighten, Noise reduction, Color, and/or Exposure) that you want Auto Adjust to use. 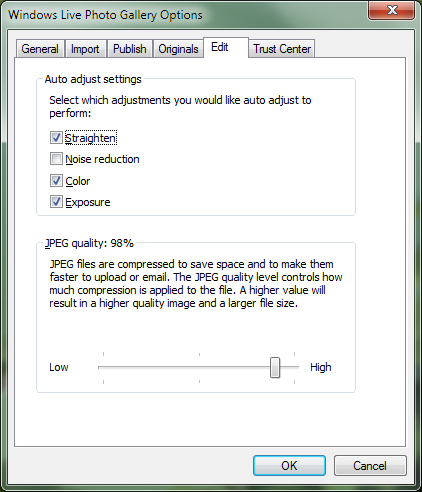 Selecting which fixes are applied with Windows Live Photo Gallery's Auto Adjust tool. The Crop tool throws up a quick grid that comes complete with rule-of-thirds guidelines. You can drag this tool around your image and resize it by clicking and dragging the markers along each edge of the box. If you need a specific output size, click the arrow for the drop down menu, and select Proportion. Then choose from a number of popular print sizes and specify a more specific crop size. 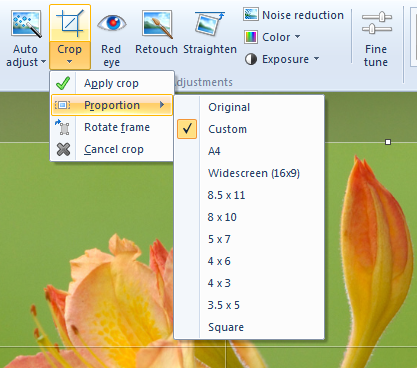 Windows Live Photo Gallery's crop tool is surprisingly powerful. Luminous red eyes are a common flaw in images taken with consumer-grade digital cameras. Windows Live Photo Gallery has a dedicated photo tool to deal with this supernatural look. Click the Red eye button on the menu bar, and drag a rectangle shape over the eye that you want to fix. Windows Live Photo Gallery will then scan the area that you selected for instances of red eye and will replace the glowing red with something that looks a little more natural. Red eye will apply instant Visine to your photos. The Retouch tool is akin to the Healing Brush in Photoshop. It's designed to remove all of the minor imperfections in your photo--such as dust on the sensor, stray pieces of trash, and unwanted background objects. This tool is worth experimenting with, but don’t expect the wondrous level of results that you can get from Photoshop's Content Fill Aware tool. Both of these tools provide very simple one-click fixes that you have no immediate control over. Each tool simply takes it best guess and then, based on that guess, makes the adjustments that it thinks a particular image needs. To make more-specific adjustments, click the Fine Tune menu option, and then use the resulting series of sliders to hone the effect you're trying to create. 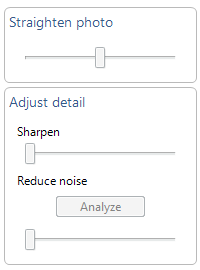 Straighten and Reduce Noise can make your photos look cleaner and sharper. Click the Color button or the Exposure button for other one-click fixes for your images; or get creative by using the drop-down menu next to each of these buttons to explore the Windows presets for color and exposure. Hovering over each option will generate a live preview of the effect that the change will have on your image. Clicking it will apply that effect. You can tweak your photo's color and exposure, too. Need more control? Open the Fine Tune menu again, and you can adjust the brightness, contrast, shadows, and highlights in your image, or set values for the black and white points on the included histogram. You can also tweak the image's color temperature, tint, and saturation to your liking. For yet more editing power, click the Create tab on the ribbon, select More Tools, and then select Download more photo tools. This option takes you to Microsoft’s Windows Live Photo Gallery Plug-in site, where you can download Photosynth (a panoramic image stitcher), an AutoCollage tool, and other photo goodies! You can download more add-ons to make Windows Live Photo Gallery even better.